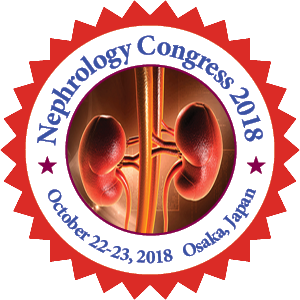 18th International Conference on Nephrology & Therapeutics from October 22-23, 2018 at Osaka, Japan. This year nephrology congress makes a stage for special sessions on nephrology and renal care at the same time with networking opportunities and furthermore gives a chance to investigate the innovative thoughts of organizations, communities, and associations. Nephrology Congress 2018 includes Keynote presentations, plenary lectures and Nephrology workshops, Nephrology symposiums by eminent kidney health care experts from around the world with outstanding contributed papers of both poster and oral presentations. Nephrology Congress 2018 has been designed to extensively explore a variety of scientific and clinical aspects of diabetes and kidney disease throughout the lifespan, and throughout the spectrum of kidney disease.